The Hatch Defender’s easy-to-install, unique non-penetrating design is engineered specifically for rooftop hatches. Included with every Hatch Defender is a GrabBar and GuardDog self-closing safety gate to completely protect against falls. 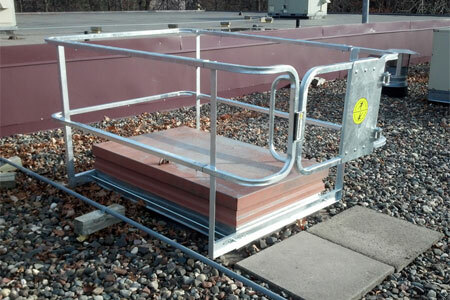 The non-penetrating Hatch Defender is engineered specifically for rooftop hatches. Its unique compression attachment system sets up in minutes and works without drilling into and compromising the curb of the hatch or your roofing membrane.